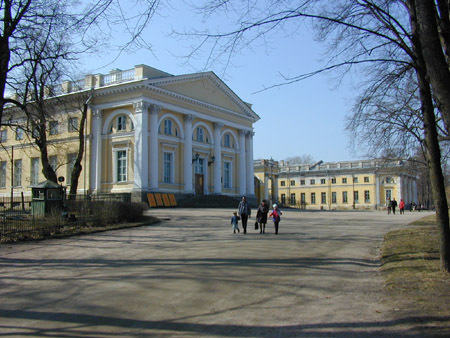 Let's continue our walk through Pushkin (formerly known as Tsarskoe Selo). 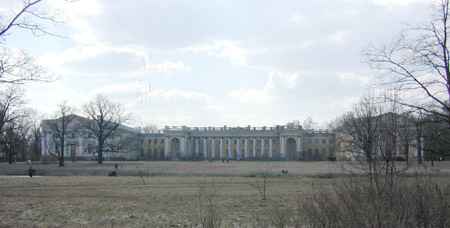 In the northern part of the Alexander Park, comparatively close to the buildings discussed in the previous album, stands the Alexander Palace. The panoramic view is subject to fairly standard deformations. Of course the palace wings are actually parallel to each other. 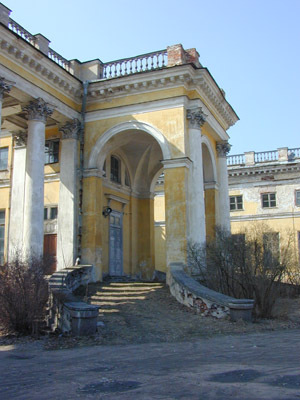 The palace was designed by Giacomo Quarenghi for Catherine II's favourite grandson, Alexander Pavlovich, hence the name. Built in 1792-96, the palace was presented to the future Alexander I on the occasion of his wedding. 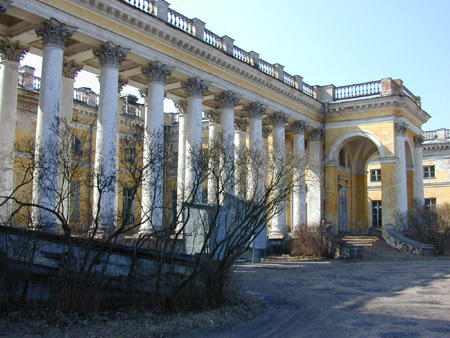 It has been occasionally styled the New Palace of Tsarskoe Selo. Following the 1905 Russian Revolution, the Alexander Palace became the permanent residence of Emperor Nicholas II who had been born in Tsarskoe Selo. It was here that he reigned for 22 years. It was also the place whence his family was deported to Siberia on August 1, 1917. In 1918 the palace was opened to visitors as a museum. Later the right wing would house a rest home for NKVD officers, and the left became the Young Communard Orphanage. 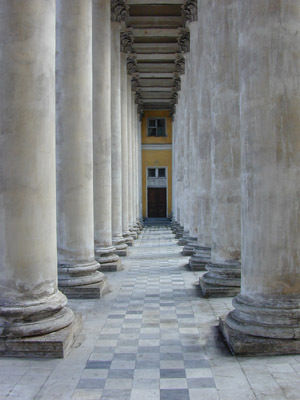 During the Nazi occupation of Pushkin, the halls of the Alexander Palace housed the German headquarters and gestapo, and the cellars became a prison. The square in front of the palace was turned into a cemetery for SS soldiers. In June 1946 the palace was turned over to the Soviet Academy of Sciences. 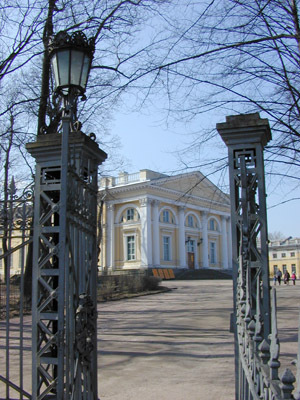 The Russian Literature Institute and the All-Union Museum of A.S.Pushkin were permitted to store their collections here. 5 years later the palace passed to the Ministry of Defence. The military has been gradually removed from the palace since 1997. It seems like they're going to restore all the interiors. Some parts of the palace are already open to the public. 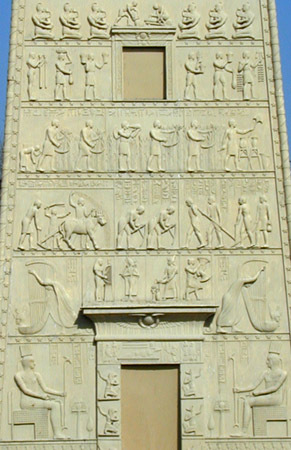 The Egyptian Gates are situated in the same area (not far from the barracks mentioned in the previous album). 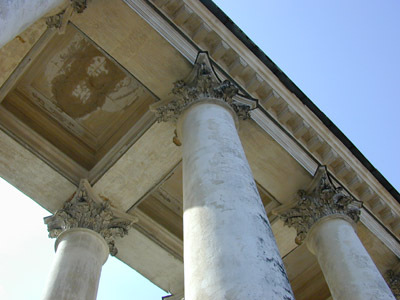 They were set up in 1827-30 in order to replace the old toll-bar which had been made redundant by the expansion of Tsarskoe Selo. According to my booklet, "the idea" belonged to Adam Menelaws, but "the project" was executed by William Hastie. 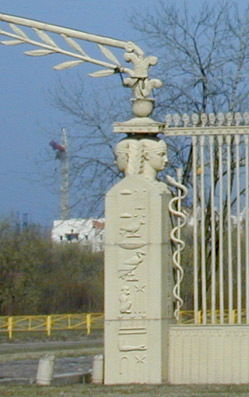 The sculptor Demuth-Malinovsky copied some of the Egyptian hieroglyphs from the drawings of Vasiliy Dodonov. 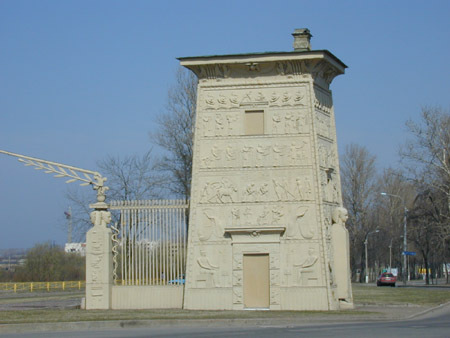 Built in brick and clad in cast-iron, the gates were restored after the World War II. 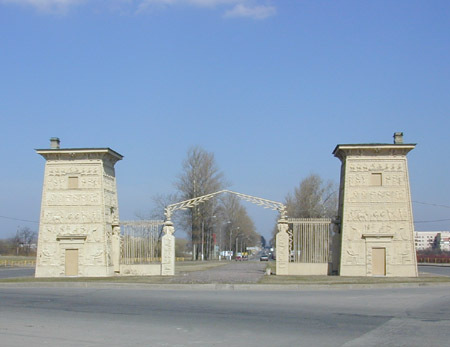 To this day the gates decorate the town's main entrance from the St Petersburg highway. 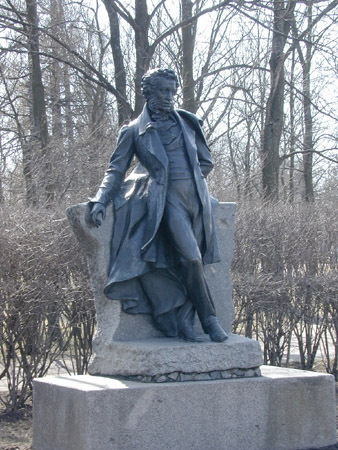 Right in front of the Egyptian gates stands the statue of Alexander Pushkin. I suppose it is the second most famous Pushkin memorial in the town (after "Pushkin sitting on a bench"). This monument was installed here in the 100th year of the poet's death. From 1912 to 1937 the statue had been exhibited in the hall of the Pushkin Lyceum.